Join the Ali Center in welcoming this month’s Daughter of Greatness, Capt. Niloofar Rahmani. Afghan military since the fall of the Taliban in 2001. Though her family received death threats, she persevered to complete her training and won the U.S. State Department's “International Women of Courage Award” in 2015. Rahmani was born in Afghanistan in 1992. Since she was a child, she had a dream of becoming a pilot and spent nearly a year studying English to be able to attend flight school. She enlisted in the Afghan Air Force Officer Training Program in 2010 and, in July 2012, she graduated as a Second Lieutenant. C-208 military cargo aircraft. Women are traditionally banned from transporting dead or wounded soldiers; however, Rahmani defied orders when she discovered injured soldiers upon landing in one mission. Flying them to a hospital, she reported her actions to her superiors, who imposed no sanctions. When her achievements were publicized, Rahmani's family received threats from both family members and the Taliban, who disapproved of her ambition and career choices. 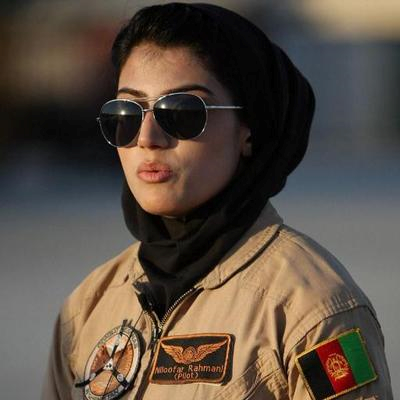 The family has had to move several times, but Rahmani is resolute and aims to fly a larger C-130 plane and become a flight instructor to inspire other women. She began training on C-130s with the US Air Force in 2015 and completed the program in December 2016, following which she applied for asylum in the United States. Rahmani hopes to eventually become a military pilot for the United States Air Force. She was granted asylum in April 2018.